Published by Lamb and Lion Ministries out of McKinney, Texas, “God’s Prophetic Voices to America” released its first edition in 2017. It is a book written by the Senior Evangelist and founder of Lamb and Lion Ministries - who is himself, one of America’s most significant prophetic voices. The ministry has over 20 national and international outlets and a weekly television program called, Christ in Prophecy. Dr. Reagan, the writer of 15 books, is a well-traveled preacher, himself with a full itinerary in which he carries the message of the gospel and the soon return of the Lord Jesus Christ across the nation. It is a book of 287 pages with a very intense introduction and history of the decline of our nation from the sexual revolution of the sixties to the present. Reagan has entitled the first section after the preface as “Prologue: America’s Spiritual Crisis.” It is a brief, but highly accurate history of our moral decline up to the present day. The book is available through Lamb and Lion Ministries, and in many outlets including Amazon. 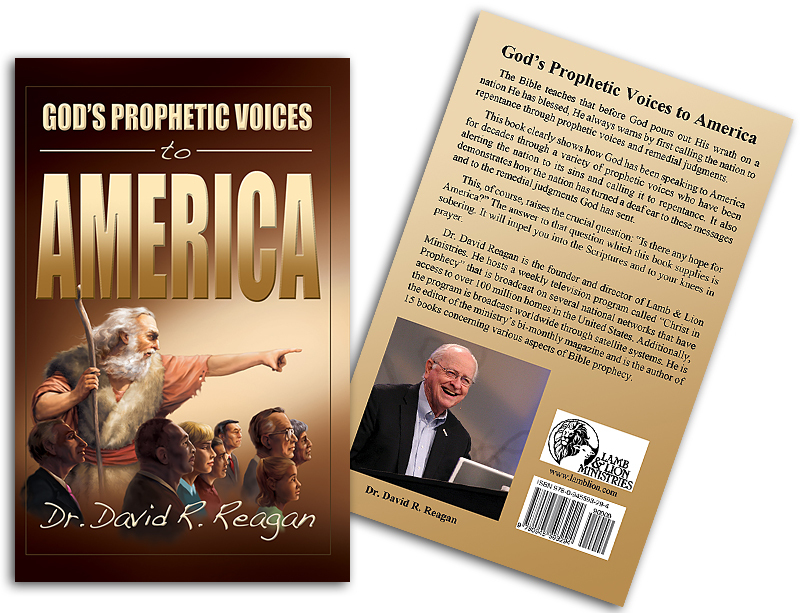 While Dr. Reagan has chosen some of the people and ministers who have a high level of notoriety, he has acknowledged that there are tens of thousands of additional prophetic voices who are fully engaged in the full defense of the gospel and prophetic warnings. In fact, it is clear that those he has chosen for the book are prophetic voices because they have chosen to use their notoriety in the service to the Lord. Conversely, it is understood that those who refuse to let their obscurity keep them from doing the work of God are also prophets in their own time. This writer has already read the full biographies of many of Reagan’s chosen examples. I was pleasantly surprised by Reagan’s ability to pull out the essence or the sense of mission and purpose each person was driven by, in an entirely succinct and meaningful manner. The chapters are not excessively long or overbearing, and Reagan’s writing skills are honed and mature. You will know what these people have said, done, and exactly what it means for the church, the nation and the world. Many long years ago I stood alone in the New York Avenue Presbyterian Church in Washington D.C., and ventured up into the pulpit where Peter Marshall stood to preach his ever famous sermons each Sunday for many years. Having just read his life story, I remembered the wave of inspiration I felt to be there where this giant once moved the hearts of so many. Fittingly, Reagan starts off his book with a look at the basic thrust of Marshall’s ministry. I was hooked, excited, and could not wait to comb through the remaining list of ministers. I was not disappointed. The second chapter roars out of the starting gate with the story of David Wilkerson. Wilkerson’s book, The Cross and the Switchblade, was made into a movie in 1970, which catapulted him into national fame. He wasted no time and used his fame to bring a powerful warning to America about the new dark course of apostasy and darkness she was embarking upon. As a young preacher, I was asked to travel up to New England and teach a very large group of young people attending a snow weekend in the mountains about the prophecies of the second coming of Christ. I wanted to stay focused entirely on the scriptures, but I knew that those kids needed something to make the prophetic words of the bible seem relevant to them. I chose as my platform David Wilkerson’s book, The Vision. Things that Wilkerson predicted in The Vision seemed almost impossible at the time it was written. Almost all of those warnings are now fulfilled and part of the new American decline into secularism, immorality, and general apostasy. Wilkerson died in April of 2011, but many of his warnings have not yet occurred. His past record is reason to believe that the future portents including, riots and fires spreading across America’s cities are all events - yet to come. I was relatively familiar with all of Reagan’s noted voice with the exception of two. The first was Donald Wildmon. But everyone including me can remember the man who got the Seven-Eleven stores and other magazine outlets to back off or cover up the rising tide of pornographic publications that slurried down the pike in the seventies. Wildmon was the Zorro type prophet of his day and his story is a remarkable read. The second person I knew little of was the amazing Jan Markell. Her story is one I am sorry I missed from the beginning. She is a wonderful Christian woman of Jewish background, a small woman with a prophetic punch like a prize fighter. For Christians who consider themselves as part of the armies of God, Markell would be a general among them. She is heard on 800 radio stations around the country and has a powerful online outreach called, Olive Tree Ministries. She has a rare combination of the deeply analytical Jewish mind, a powerful Christian testimony, and a penchant for staying on the frontlines of the prophetic in our nation today. Her story was an encouraging incentive for me, and she has now become a powerful source of information and encouragement as well. One of the finest chapters in Reagan’s book is the story of Franklin Graham, the son of Evangelist Billy Graham. Reagan answers the important question of why there is such a difference between Franklin’s ministry and that of his evangelist father. Franklin Graham does more than espouse a prophetic calling. He has stood against the powerful men and demonic forces, even while being threatened, cancelled, and persecuted by many including such notables as Barack Obama. Franklin’s story is worth its weight in pure gold and adds more veracity to the idea that God still speaks in today’s world than any other testimony in Reagan’s book. Franklin may be the only one who could use and alter the line in the famous Sinatra song, “My Way” with - "the record shows, I took the blows, and I did it Christ’s way." We would love to preview all of the voices noted in Dr. Reagan’s book, but for the sake of brevity we cannot, but mention another incredible voice in his list. That is the voice of Rabbi Jonathon Cahn; and although he has been often misunderstood, he stands as one of the most important prophets of the day. His fictional book, The Harbinger, became the catalyst and launch pad for Cahn’s amazing ministry of warning to America. Hyper-critics have decided that his likening of America’s present decline and that of ancient Israel is extravagant. Nothing could be further from the truth as scriptures declare. The Holy Ghost speaks today of things not just from the pastor of the present and future, but He speaks from the realm of eternity. What has been is now, and human nature and the rise and fall of many nations since Israel’s golden era are proof that we will always make the same mistakes, as we are doing at this day. Following The Harbinger, Strong friend and supporter of Cahn’s ministry, WND Editor Joseph Farah helped the Rabbi to produce a powerful video entitled, “Isaiah 9: 10 Judgment.” I had the distinct pleasure of interviewing Mr. Farah about that video and subsequently wrote an article containing the essence of the interview. The article, “ISAIAH 9: 10 JUDGMENT - Video Review and Interview with Producer Joseph Farah” explains in detail some of the resistance Cahn had to deal with and Reagan’s book adds many more specifics to that subject. What we can agree on is this – Cahn is a prophet and his warnings to our nation should be given full credence as we tumble down the hill to our own demise. Dr. Reagan starts his summary by quoting The Prophet Ezekiel. After that he makes a most astonishing, almost precipitous statement. Prophets are given the vision to see what God is about to do, they are often called seers for this reason. But when they declare that something is at an end – it is time to prepare. It is beyond doubt that somewhere between the very Godly upbringing David Reagan went through and a specific day or time when God called on him to preach, prophesy, write and minister, America was given a prophet for these times. Of particular note, is a sub-heading called, How God Deals with Rebellious Nations. He explains how God uses remedial judgments using examples that are derived from the Bible and current events. These examples are all familiar and up to date. These explanations are far above the realm of general interest, they are accurate descriptions of the measures and extremes to which God will go to bring nations, including America, to renewal or complete destruction. Reading Reagan’s summary is the capstone of the entire work. The book would be worth the read just to get to his summary. Two facts always emerge when I search for America’s true prophets. First, they are always deeply grounded in Gods inerrant word. The second thing I see is that I can recognize their vision, calling, and ministry without mulling around in doubtful disputations. While I am a prophet, I am not “the” prophet to America; rather, I am just another prophet among many God has chosen, and I will never deny that. It is this fact that makes me glad to see another man like Dr. Reagan using his gifts, calling, and skills to warn this nation that many of us e love, that it is approaching a deadly, critical day of God’s interventional judgments. To say this book is a must read, is simply not enough. It may be one of the most important books of its kind since Hal Lindsey’s, Late Great Planet Earth. I have always rated film and book reviews on a scale of one to ten, but this book transcends my ratings. For all those who are striving to understand prophecy and what it means for our nation – this book is a national treasure.